Whether its Android or iOS, both are pretty good and have their pros and cons but which one’s better? If that’s the question that’s stuck in your head, then you have come to the perfect spot. 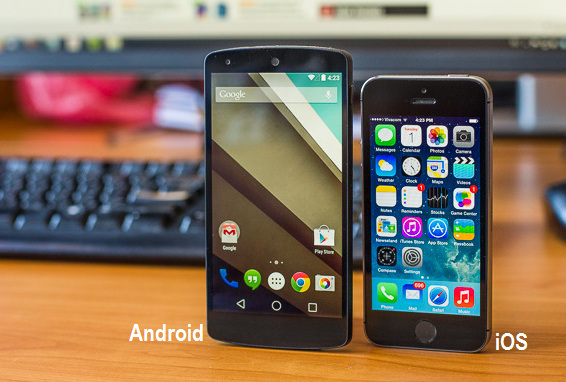 We will give you a brief Comparison between Android and iOS that will help you in narrowing down your options. Let’s get started from the top. iOS is an operating system, that is strictly designed for Apple devices i.e. iPhone, iPad, iPod Touch. While Android is the operating system that is being used by plenty of tablet and smartphone manufacturers. Unlike iOS, Android mobile operating system is powered by an open source framework. Android users enjoy full freedom and as it offers, plenty of space for customization. While in iOS, customization will only be possible when it has been Jailbroken. For downloading apps, games etc., Android has a ‘Play Store’, while iOS has an ‘Apple Store’. Here, it would only be fair to mention about a recent survey, which tells us that people who use Android, download far more apps, than the ones, that use iOS. Yet iPhone generates a lot more revenue than Android does. The reason being; as compared to Android, iOS has way more paid apps, In quantity wise apps comparison, Android wins here. But in quality, Apps in iOS will be a better choice. Like we all know, everything (good) comes with a (bigger) price. A presentation taken by StealthLuck explains these and some other interesting facts with some dancing textual. You should also know that there’s some price difference between Android phones and iPhones, as well. An average Android phone is pretty cheaper than an iPhone. Android phones, are universally $261 - $374 cheaper than iPhones. In terms of sale; over 187 million Android phones have been sold in 2014, alone. On the other hand, Apple has been able to sell over 43 million iPhones, Android wins here too. But wait till you get to know what a recent research tells us. It’s quite interesting to know, that almost 78% iOS users will opt for another iPhone in the future, while 67% of the Android users will keep on sticking to Android Phones. Who’s winning now? With a yearly increase by 24%, Android dominates in terms of covering 57% of the market. On the other hand, iOS covers 10% of the market, with a yearly increase of 17%. In generating revenue (this year – in US); Google’s Play store’s revenue got increased by 55%. With boasting 80% increase, Apple’s App Store revenue generation went sky high. Bottom Line: In terms of sales and popularity, Android is the winner, but in terms of RIO, iOS leads the way.